The U.S. nonfarm payroll figure for May is 138,000, failing to hit a Dow Jones forecast of 184,000. Yields are moving lower on U.S. debt in reaction. Some big revisions downwards. April was trimmed back to 174,000 and March was trimmed to 50,000. The unemployment rate is down at 4.3 percent. Average hourly earnings was up 0.2 percent in May. 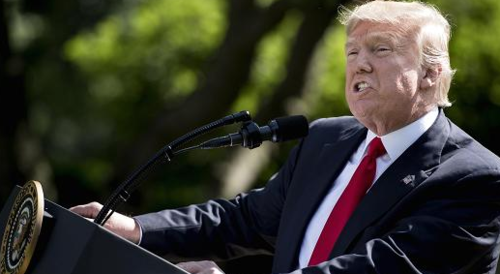 President Trump says he chooses Pittsburgh over Paris, pulling the U.S.out of the 2015 climate deal that was signed by 147 countries in a landmark green alliance. The move prompts an international outcry from the political and business world, while Italy, Germany, and France say Trump's plan to renegotiate the deal is impossible. Donald Trump also attempts to revive his travel ban, submitting an appeal to the U.S. Supreme Court. In St Petersburg, Russian President Vladimir Putin prepares to take the stage with Indian Prime Minister Narendra Modi at a key moment for relations between the two nations. The Nasdaq composite gained about 0.8 percent, hitting intraday and record highs. The S&P 500 also rose nearly 0.8 percent to notch all-time highs, with materials, financials and health care leading advancers. The health care sector also reached its first 52-week high since March 15. To watch today is the jobs report. President Trump has announced that he will withdraw the United States from the 2015 Paris Agreement to fight climate change. Speaking in the White House Rose Garden, Trump said the U.S. will begin negotiations to re-enter the accord, but warned he would only accept a deal that is fair to Americans. 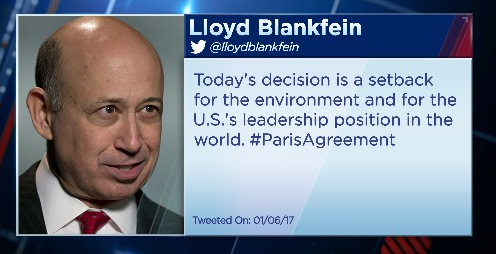 Numerous U.S. business executives and global leaders reaffirmed their support for the climate agreement and condemned Trump's decision. JP Morgan CEO Jamie Dimon and CEO of Goldman Sachs Lloyd Blankfein have both criticized the move. On air Rob Bailey, Research Director at Chatham House says the move cedes global leadership to China. There has been widespread condemnation of President Donald Trump's decision to withdraw the United States from the 2015 Paris Agreement. 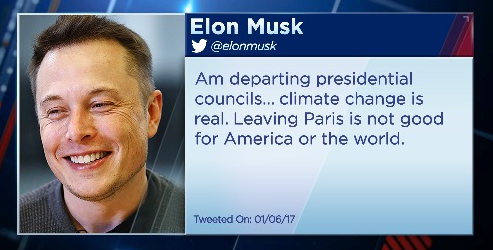 Elon Musk is dropping out of presidential councils. The Goldman Sachs boss is critical. The Disney boss is another withdrawing from presidential councils. U.S. crude inventories fell sharply last week, boosted by a jump in refining activity as exports hit record highs, according to data from the Energy Information Administration. It marked the eighth straight week of declines in U.S. crude stocks. 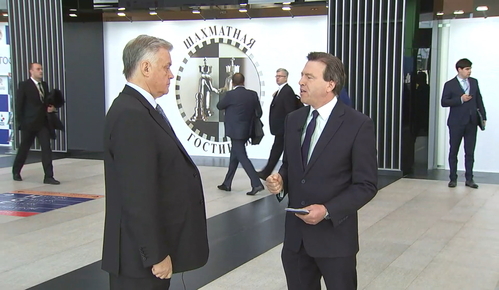 Vladimir Yakunin, Chairman of the DOC Research Institute and former President of Russian Railways is on air with Geoff at the St. Petersburg International Forum in Russia. On Trump's abdication of leadership in areas such as free trade and climate, Yakunin says he predicts a turbulent time as the world appears to "disagree on everything". He says the ability to dialogue about sustainable development is vital to the world economy. On sanctions against Russia, Yakunin says they are a political and ideological tool rather than a practical solution. On the rise of the East, Yakunin says GDP growth alone tells us that Asia is an obvious growing power on the world stage. 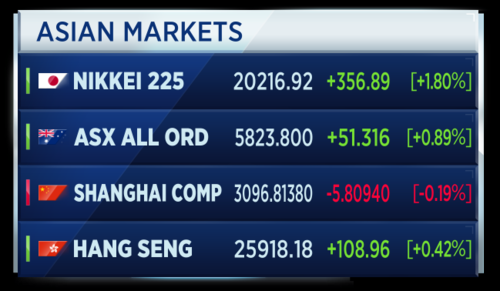 Asian markets are mostly higher in early trade following the release of strong economic data stateside, including better-than-expected ADP private payrolls figures. Dollar/yen hit a one-week high, with the greenback fetching 111.61 yen. This was higher than levels around 110.8 seen earlier in the week. That weakening yen helping the export-heavy Nikkei index. President Trump says he chooses "Pittsburgh over Paris", pulling the U.S.out of the 2015 climate deal that was signed by 147 countries in a landmark green alliance. Donald Trump also attempts to revive his travel ban, submitting an emergency appeal to the U.S. Supreme Court. 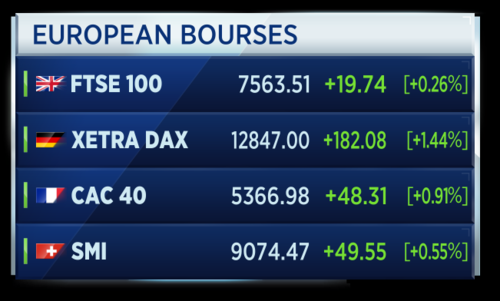 Markets in Europe are set to open higher on Friday morning as investors focus on data and as the world digests the news that the U.S. is withdrawing from the Paris climate change deal. The FTSE 100 is seen 47 points higher at 7,590, the DAX is set to open up by 81 points at 12,746, and the CAC is seen higher by 38 points at 5,357. 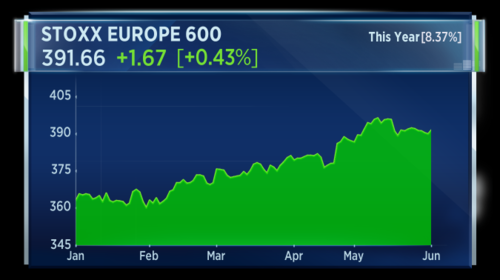 European stocks have shown solid gains in the first 5 months of 2017. 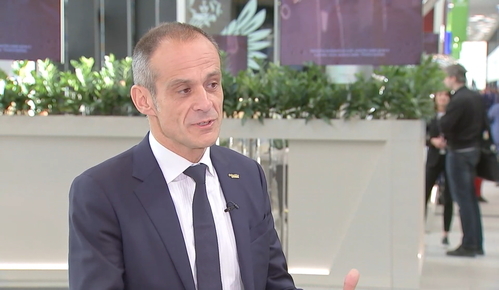 Jean-Pascal Tricoire, CEO at Schneider Electric is on air with Geoff in St. Petersburg for the SPIEF forum. Geoff kicks off by asking Tricoire if Trump's attempt to renegotiate the Paris climate accord will prove costly to firm's such as his that attempt to provide power in a more efficient and renewable manner. He says he doesn't think Trump's move will change the momentum in the United States to reduce carbon emissions. He says it is a question of good economic sense. If you are a city looking to be attractive on a global scale you have to be a green city. Tricoire argues that making things digital "from the power plant to the plug" is both efficient and cost saving and therefore will still prove attractive to cities and business. 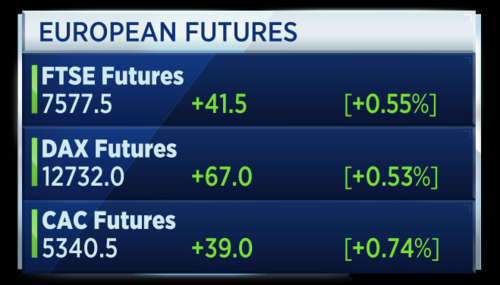 European futures are now in full swing and after yesterday's healthy session (for those long stocks), it seems a positive open is again on the cards. 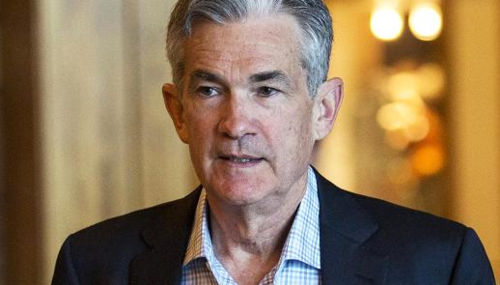 Federal Reserve Governor Jerome Powell says he expects the FOMC to raise interest rates 3 times in 2017, if the U.S. economy continues at current strength. Speaking exclusively to CNBC, he also said it would be appropriate for the Fed to begin shrinking its balance sheet later this year. However, he declined to specify how much the central bank is planning to reduce its bond holdings by. It really depends on a whole bunch of factors which haven't been decided yet. But it's hard for me to see the balance sheet getting lower than two and a half trillion let's say two and a half to three trillion and that that assumes that we normalize the balance sheet over the course of the next five years and go back to a fairly small number of reserves. The Times newspaper is reporting that British Airways believe a human error was the cause of its global computer failure which continues to disrupt the travel plans of thousands. The U.K. media outlet reports this morning that the airline believes a power supply unit was shut down in error, causing the resultant chaos. 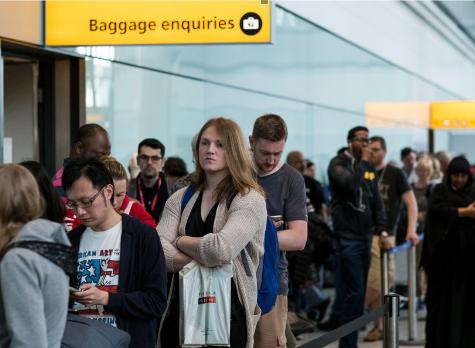 Although flights were back to normal by Tuesday this week, it has been reported that many people are still on holiday without luggage. 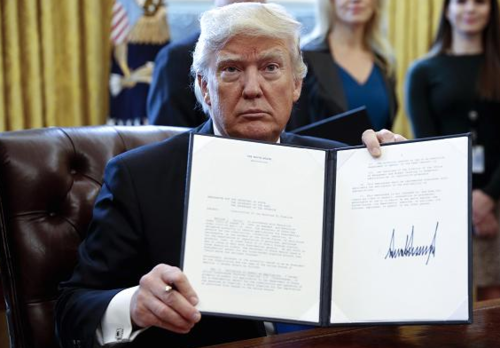 President Donald Trump's administration on Thursday asked the U.S. Supreme Court to back his ban on travelers from six Muslim-majority nations after it was previously blocked by lower courts. According to Reuters and other news agencies, the administration filed two emergency applications with the nine Court justices. Trump's team wants to block two different lower court rulings that had ruled the March 6 order barring entry for people from Iran, Libya, Somalia, Sudan, Syria and Yemen to be discriminatory. The administration has asked the Supreme Court to allow it to enforce the executive order for now, while the justices weigh whether to hear the appeal in Autumn. The bans would last 90 days while the U.S. government implements stricter passport checks. The love-in between Saudi Arabia and Russia appears to remain on track. Saudi Arabia will reportedly consider investing in Russian company Eurasia Drilling according to the TASS news agency. These comments are attributed to Saudi Energy Minister Khalid al-Falih at the economic forum in St Petersburg. Eurasia is Russia's largest oilfield services firm. 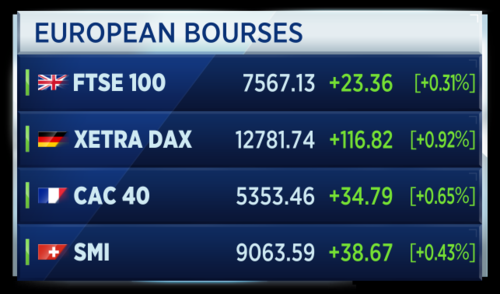 On balance, it is a positive open in European stock markets as the first rush of trades are processed. ...but energy related stocks are clearly suffering as the oil price dips. 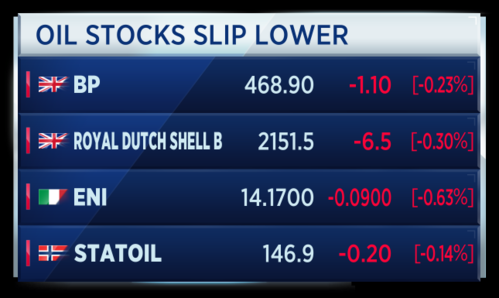 The effect of oil price falls is fairly evident on stocks as we start the week's final trading day. 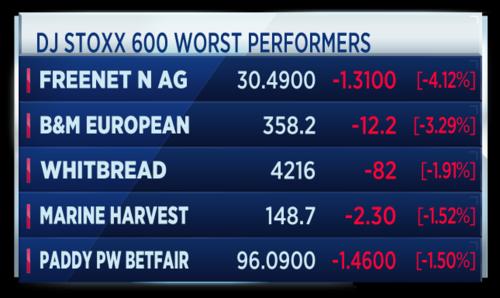 The best and worst stocks in Europe look like this. 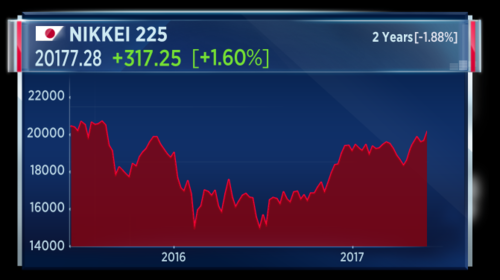 The Nikkei has hit a near 2-year high thanks in large part to a weaker yen. Strong US data provided the dollar with impetus versus the yen. A weaker yen is strongly correlated with a positive Japanese equity performance. Oil prices under pressure, with Brent crude falling below 50 dollars a barrel, amid concerns that President Trump's decision to exit the Paris Climate accord could spur an increase in drilling. The leaders of Italy, Germany, and France issued a joint statement criticizing Trump's withdrawal. 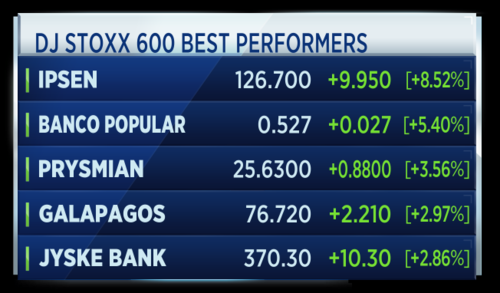 European banks are leading gains in early trade. 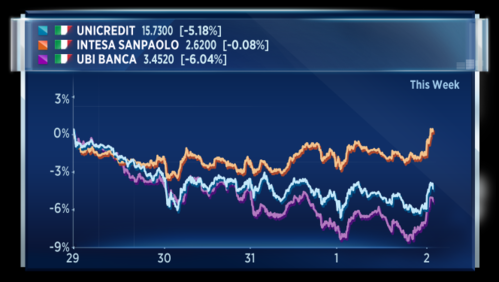 Investors are keeping a watchful eye over the Italian banking sector, after the European Commission and Italian authorities reached an agreement on the restructuring of ailing lender Monte dei Paschi di Siena. The boss of Exxon Mobil, Darren Woods, has said his plans for the U.S. oil firm are not affected by President Donald Trump's announcement that the United States are pulling out of the climate change deal. Additionally, the European Union President has told an EU-China business summit that there can be "no backsliding on the Paris Climate agreement". 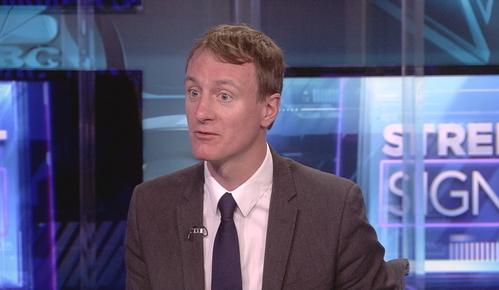 Colin Hamilton, Head of Commodities Research at Macquarie is on set with Carolin. On the sliding oil price, the commods man says the selling has some justification with the United States capable of upping production. We are on track for U.S. production to be 1.5 million barrels a day higher this year than last year and we also have a number of new drills that are basically ready to go. 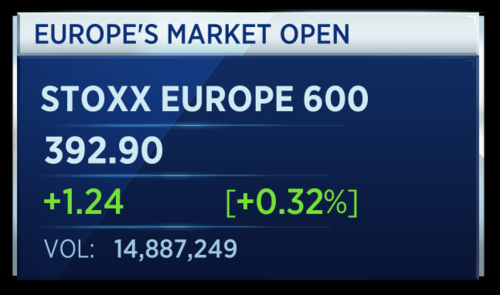 Oil might be slumping but European markets are overall pretty positive with the Stoxx 600 up roughly half a percent. The FTSE has hit a fresh record high. Strong economic data from the U.S. is pushing a risk-on sentiment. The main individual bourses are looking like this. 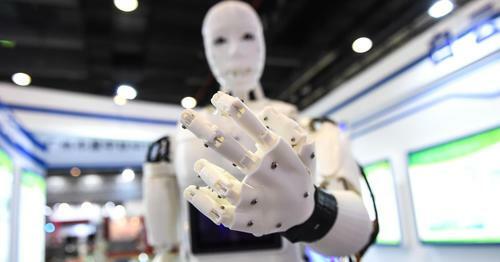 CNBCMicrosoft founder Bill Gates wants to tax robots who take people's jobs, but a top European Union (EU) official has other ideas. The Mayor of Pittsburgh says he is "outraged" by comments from President Donald Trump on climate change. If you recall Trump said he was responsible for Pittsburgh, not Paris when it came to the climate change. 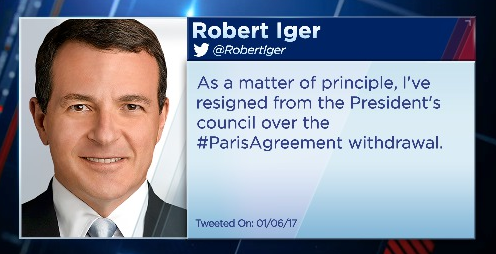 He made these comments outside the White House Thursday as he confirmed the U.S. withdrawal from the Paris climate agreement. The UK May construction PMI has beat expectations, coming in at 56.0 versus a poll which gave 52.7. That May number is the highest figure since December 2015. 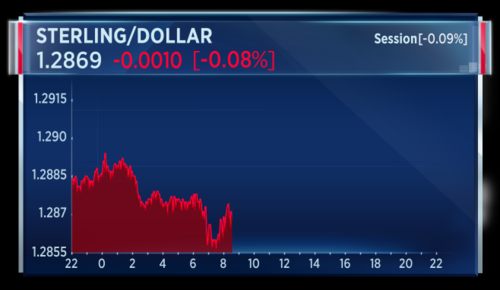 Sterling not moving much however but it is potentially paying more attention to next Thursday's U.K. election. Nagaraj Naidu, Joint Secretary of Economic Diplomacy at the Indian Ministry of External Affairs is with Geoff in Russia at the St Petersburg International Economic Forum. Geoff asks if a warming of relationships with Russia means a distancing of ties with the United States. He rejects this notion and says it is not a "zero sum game". Naidu says Russia has been an old friend to India and the relationship has always been close. He says the pair are looking to diversify beyond government to government contracts and outside the sector of defense. Oil prices have fallen amid fears that Donald Trump's withdrawal from the Paris Climate change accord will trigger more drilling in the United States. This as Russia's Rosneft CEO says low oil prices are here to stay and that US producers have the ability to create market instability. 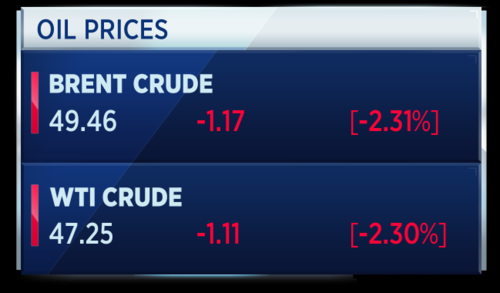 Oil remains down more than 2 percent on both the WTI and Brent contracts. Is the U.S. now a swing producer in the oil market? The U.S. oil industry exported a record 1.3 million barrels of crude per day onto the world market last week, a half million barrels less than the cuts OPEC and Russia agreed to make to daily production. U.S. data show record refining runs of 17.51 million barrels a day. 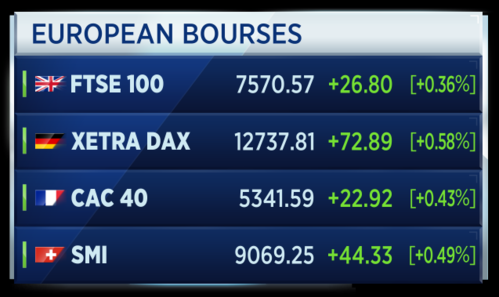 Markets in Europe moved higher on Friday morning as investors focused on data and digested news that the U.S. is withdrawing from the Paris climate change deal. Here's the latest "Investment Banking Scorecard" from Thomson Reuters, which provides looks at trends in deal making around the world. The data shows merger and acquisition activity is increased on the previous year, and IPO activity is speeding up significantly. 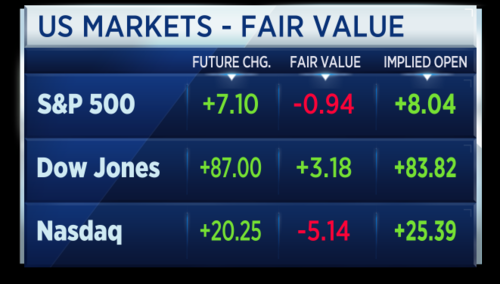 This is what's coming up in U.S. markets today. The big piece of data is the latest U.S. jobs data, which'll provide important clues for whether or not the Fed decides to hike interest rates this month. At 8:30 a.m. ET we have May nonfarm payrolls. The previous month saw 211,000 jobs created. A reading of 184,000 is forecast today. At the same time we have the U.S. unemployment rate for May, seen unchanged at 4.4 percent. We also have May average hourly wages, forecast to be just 0.2 percent higher, as well as April's U.S. trade deficit. That's forecast to have grownt to $46.2 billion from $43.7 billion the previous month. 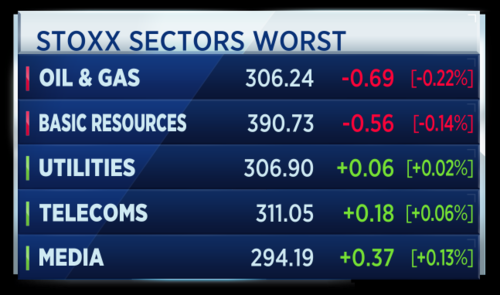 Not much to watch for on the earnings front. Canada Goose and Hovnanian are expected to report. Robert Murray, President and CEO of Murray Energy Corporation, says President Trump has acted courageously in pulling the U.S. out of the "fraudulent" Paris Agreement on climate change. 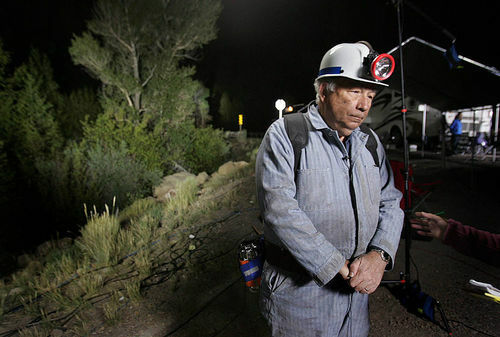 He says coal costs a sixth of the what it costs to use energy from other sources. He says leaving the agreement will benefit the coal industry and allow it to grow. White House staff and high-profile Republicans have come out strongly in support of President Trump's decision to leave the Paris climate change accords. Here's what some of them had to say on Twitter. In reaction to yesterday's announcement, the international community is placing an increased amount of pressure on President Trump to remain part of the Paris Climate Deal, according to Tom Duncan, partner at law firm Mayer Brown. He adds that the move will place focus on the viability of wind power, especially in the U.K.
For the U.K., the winds are about to turn on the historical issues affecting the sector – exciting technological advancements mean we are finding ways to build wind farms in deeper waters. And it’s not just important for the U.K. - offshore wind is likely to remain a key aspect of any sustainable energy strategy for countries with coastal waters and represents a significant opportunity for the industry for years to come. With or without the Paris Climate Deal, it is likely that offshore wind will continue to grow in the U.S. over the next few years. Meanwhile, Paul Donovan, global chief economist for UBS, said in his daily audio comment that Trump’s retreat from the Paris Agreement is not going to have an immediate impact on the U.S. economy. Politicians rarely do have an immediate impact on the economy in anything that they do. However, the decline in U.S. authority on the global stage, and the possibility of a close alliance between the European Union and China, is something that may affect patterns of economic policy and economic development over the medium term. Donovan added that the economic rationale given for the retreat is common in countries that are unsure of the challenges of the industrial revolution. Confronted by change, there is often a strong desire to hold back the tide, King Canute-like, and defend the status quo. U.S. markets closed at all time highs yesterday. 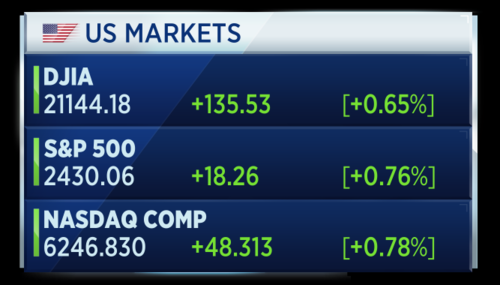 The Dow is now around 25 points off its all-time intraday high. That buoyancy is seen in the future values, which call for a move higher at today's open. With stocks near all-time highs, some are concerned stocks may be overvalued. However, Michael Stanes, investment director at Heartwood Investment Management, says there are pockets of opportunities within the market, as growth stocks are trading at a premium to value stocks. Based on the assumptions that (1) US corporate profitability continues to improve; (2) economic conditions remain supportive and (3) any announcement of future policy action by the Trump administration is enough to support sentiment (given expectations are now so low), then we would expect to see these value areas of the market recoup some of the losses suffered as the ’reflation trade’ has unwound. Russian energy minister Alexander Novak says the U.S. exit from the Paris climate agreement is a serious negative signal. However, he added that Novak does not expect other countries to follow the U.S. out of the agreement, Reuters reports citing Interfax. Russian President Vladimir Putin and other world leaders are speaking at the St. Petersburg International Economic Forum (SPIEF) today. 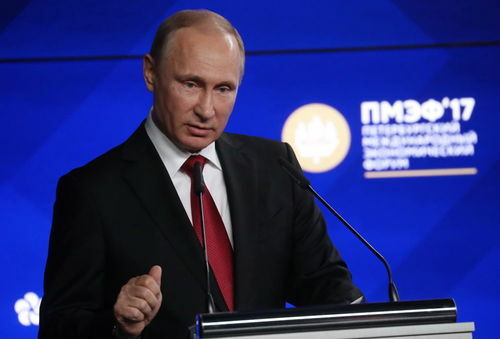 Russian President Vladimir Putin is delivering opening remarks to an audience at the St. Petersburg International Economic Forum. He is discussing the country's economic development and says foreign direct investment into Russia in the first quarter came to $7 billion. 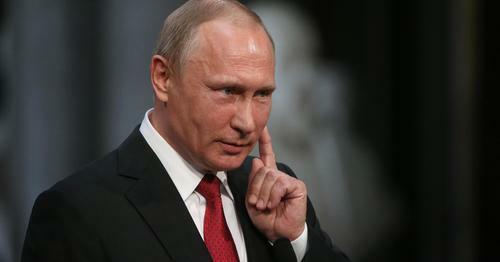 Speaking at SPIEF, Vladimir Putin suggest tax breaks for investors in Russia should be extended beyond 2025. Putin is speaking before the start of the plenary session, which will be hosted by NBC News Anchor Megyn Kelly, will also include addresses from leading global figures including India's Prime Minister, Austria's Federal Chancellor, and the President of the Republic of Moldova.